The holidays is fast approaching and most people are already on the lookout for unique gift ideas that will make gift giving even more memorable this Christmas. Whether you are creating a personal gift list or making a holiday gift guide that you would like to share to others through a website or a personal blog, it is important that you create one that is useful, practical and inspiring. The holiday gift guide that you should create must contain gift ideas and recommendations that others will find interesting. Feature products that are unique and those that can be used regularly such as the iCoffee Opus, which is perfect for coffee lovers everywhere. 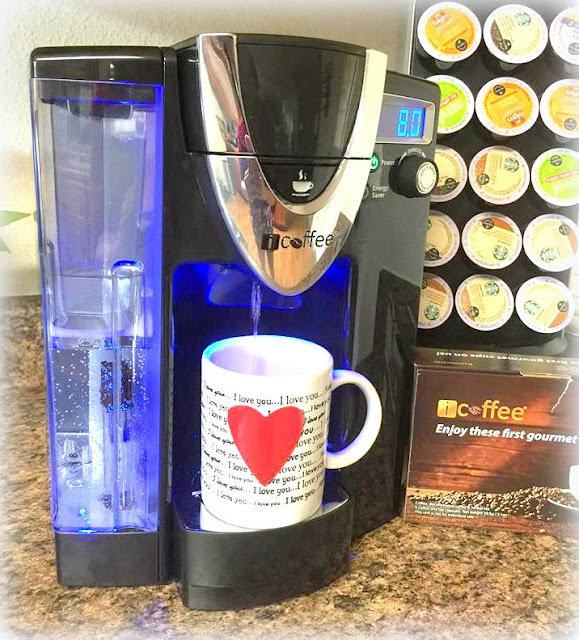 The iCoffee Opus Single Serve Brewer provides an exquisite cup of smooth tasting coffee every time. Adjustable brew strength. Includes: Bonus iCup reusable cup for brewing your own coffee. 6 count variety coffee pod starter pack. Spinbrew™ technology steams, spins and stirs inside the K style cup to virtually eliminate acidic and bitter aftertaste. Works with all single serve style cups including K cup, one cup and real cup capsules, plus K style cups form every private label brand and maker. It has removable drip tray allows for travel mug. It brews up to a 12 oz. size mug of coffee. I like the fact that the removable water reservoir can hold up to 75 oz. . The dial a brew feature lets you select a size from 4 to 12 oz. Auto shut off control and energy saver mode. Oh, boy! I love every feature of this amazing coffee machine! I've been using this product for a week now, and I have to say that this is by far the best coffee machine I've ever had. It brews faster than fast, hotter than hot, and smoother than smooth. Not to mention, the quality is much higher than other brands out there. I would highly recommend this coffee machine to everyone! For more details or would like to order, you should check out icoffee.com. Don't forget to like them on Facebook or follow them on Twitter for updates and promotions. So what are you waiting for? Oh my god, yes. That is a wonderful gift idea. Especially for hard-core coffee lovers like myself. I don't drink coffee, but if I did, I would love that single serve coffeemaker. We used to have a coffee machine and it looked quite similar I wonder if it was the same brand. This would be perfect for our kitchen! This is perfect gift idea for those who a coffee lover, I love it too. This is really cool. I've been thinking about getting a coffee maker like this. Maybe it's about time I did. This is such a cool coffee machine. My boyfriend would use it every day! It would make the routine so much quicker! I love coffee. I would love to try this machine for a great cup of coffee. I could use that coffee maker! I have an iCoffee. I totally love mine. It's so easy to use, clean and works great. This sounds like a great coffee maker! I've never heard of it before! Oh, I want one of these. I love coffee and this looks like a great coffee maker. I love that it uses single-serve cups - I love the freedom they give me to choose what kind of coffee I feel like at that particular time! This would make a great gift for a coffee lover. I love making the individualized sized cups of coffee. Interesting seeing competitors to the big K advertising! We got our coffee machine last Christmas and it changed our life. The right one starts your day off perfect! I'm a coffee lover, I think it's perfect for me. As a coffee lover/addict, I would love to have this as a gift. Awesome! I am curious about the pot. My Keurig breaks steadily once a year and I've bought way too many. I love it,but I'm willing/ready to switch to something that lasts longer. This is a perfect gift for avid coffee drinkers! I got a handful of friends who would be loving this machine! This sounds like a fabulous gift idea!! My grandma is coffee obsessed! She would love this!